Welcome to Inso's World and this week I have no hobby stuff to share. Why? Well... if you read on, you'll find out. In the military, you often have to go away on detachments/deployments and sometimes they are planned months in advance and a rota is sorted out so that people can be sent out and replaced when their time is up. It relys on the people who are chosen, being fit to deploy. When you are chosen for a deployment of this kind, you are given a 'go' date and you are given a 'reserve' date. The reserve date is a detachment length before you are due to deploy. Your go date is when you should have your boots on the ground. I am on such a list and have a go date and a reserve date. my go date is April 2015. My reserve date is December 2014. Unfortunately, it looks like the person who is due to go out before me, may be unfit to deply so it is very likely that I will be going in December. As you can imagine, that means that I have a lot of stuff to get sorted out before I go and as a result, my hobby time will be dramatically reduced (if not stopped all together) so that I have the time to get prepared to deploy. I am not going anywhere nasty (once I'm there, I will share more) but it is from 4 to 6 months away. So... if Inso's World is devoid of hobby stuff for a while, that's the reason. But it isn't all doom and gloom. When I get where I am going, I will have a decent room and will have time to sculpt a bunch of arms on a bunch of Squats and will be taking hobby stuff with me to keep me entertained. I also plan to do a little writing so I will have stuff to share while I am away. What have I been upto this week? I have primed and base-coated the Mechadrome, light mech, a nice military green and I have started to work on my Diorama of doom... but that will all have to wind down for a bit so I can sort stuff out so that my wife doesn't have my hobby clogging up the living room while I am away. See you from the strange new world. Before I start, I would like to welcome zorro the Inso's World. I hope you find lots of things to keep you occupied during your stay and feel free to share comments if there is anything that particularly interests you. I guess Autumn is properly here. It has been dreary, with a capital D, all week. It didn't help that I have pulled a muscle in my back which meant meds and a lack of mobility... but I didn't let it stop me going to a wine and cheese tasting evening this week (I am not a big wine fan and cheese doesn't agree with me... but we had a great evening anyway). He has mentioned that the original miniature will also be sold at some point so if you are interested, pop along to Impact Miniatures to see what's what. Thanks to Tom for his very kind gift. I decided to keep a lot of the details simple and hope that he looks OK. I wanted to give him a questioning look so I tilted his head slightly and made him stare into the sky. The base is just a CD with a disc of plasticard glued on. It will turn into a Diorama over the next four weeks and I will keep posting WIP shots in the meantime. 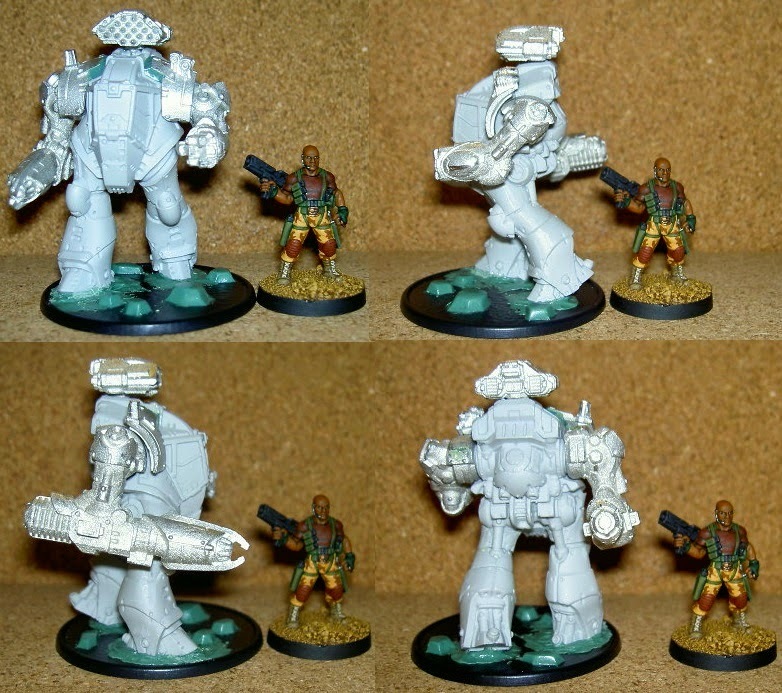 Grant (from Hasslefree Miniatures) is just there to show the size of the mech. This mech was much better quality than the medium mechs but still had issues with the little steps that went up the right leg... so I trimmed them off. Apart from that, I couldn't work out how the shoulder armour should go so I added a few bits of plastic to pack things out and used Green Stuff to sort the gaps. The rest was a doddle to assemble. I have another five of these to build so I hope that they will be faster to assemble now I have sorted the shoulder problem. I think you'll agree that the light mech is a joy to behold. So not a bad week really. Hopefully, this coming week will see more progress on the Diorama and also the Squats (with maybe a little assembly of Mechadrome mechs into the mix). 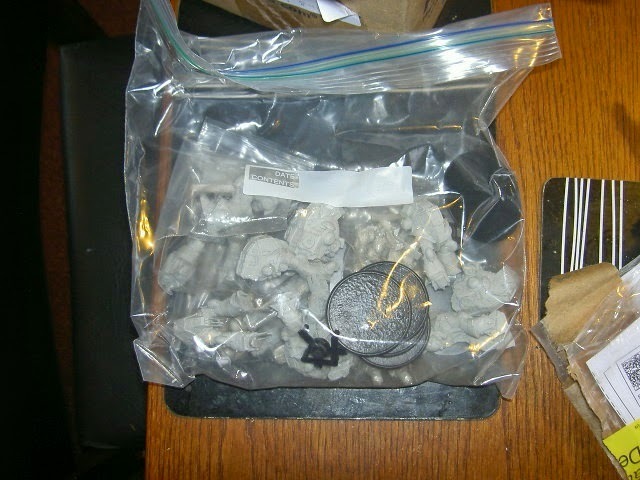 They are Greys from Tengu miniatures. 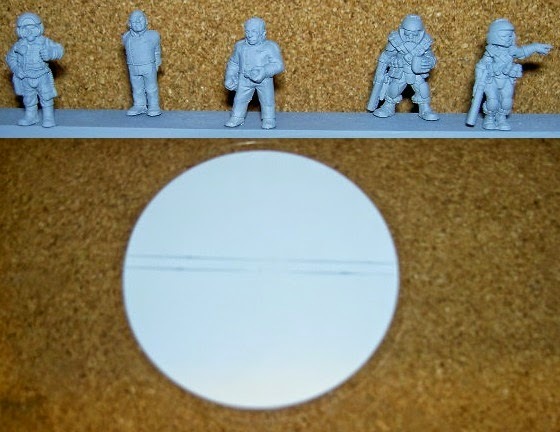 Unfortunately, Tengu seems to have disappeared but I have just found out that many of the Tengu miniatures (including the Greys) are available from CP Models so I am still able to get hold of them when I decide to expand the force. I am quite pleased about this. See you from the middle of the fast-flowing fjord! A week of nice distractions. I knew I wouldn't be able to focus on the Squat project this week... especially when I have my Mechadrome mechs sitting so close. As a result, I have spent a lot of the week messing around with my mechs and... to be brutally honest... first impressions didn't last. 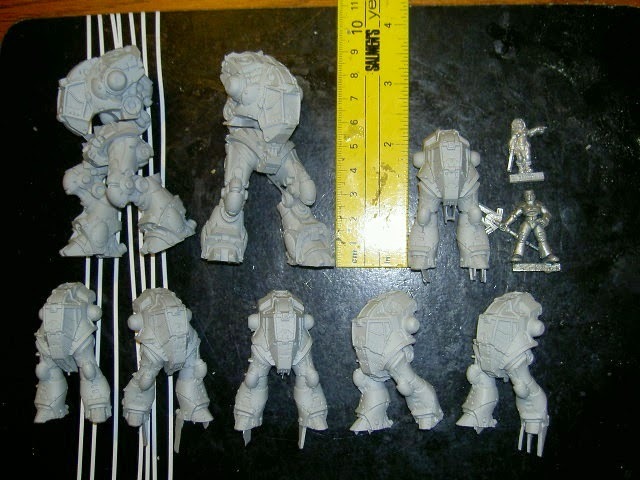 Don't get me wrong, the mech casts have suberbly sharp and crisp details but while I was cleaning up the resin components, I quickly realised that quality control at Gangfight Games could be a little better. 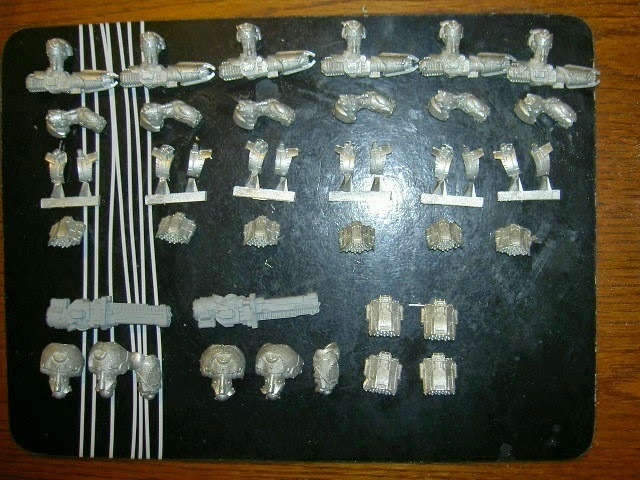 This week, I have focussed on cleaning up the resin components and getting them washed ready for filling/assembly. The light mech bodies aren't too bad apart from one or two being fractionally misaligned and the steps on the right side being in various states from perfect to missing... but not so bad that I couldn't fudge it enough to look OK (that means 24 little brass foot rails need to be made and fitted into 48 little drilled holes). 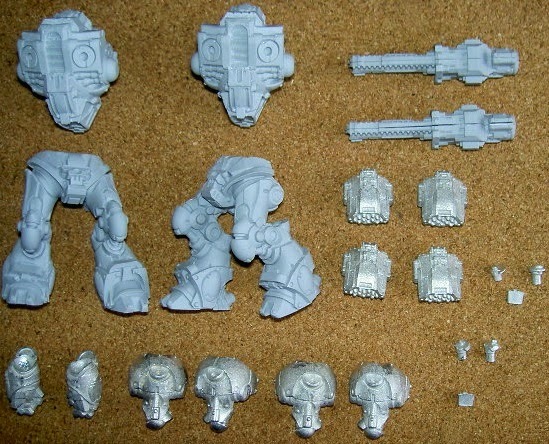 The picture shows the torsos, legs, gun-arms, rocket pods (they go on the top of the torso), a pair of fists, the shoulders, the little pistons (for the rear of the legs) and two mystery components (I think they fit to the front of the cockpit... but I guess I'll just have to wait and see). The legs were slightly misaligned and took a lot of work to look OK. The torsos were slightly misaligned and took a lot of work to look OK. There are a good few airbubbles and blobs of excess resin that obscure details. 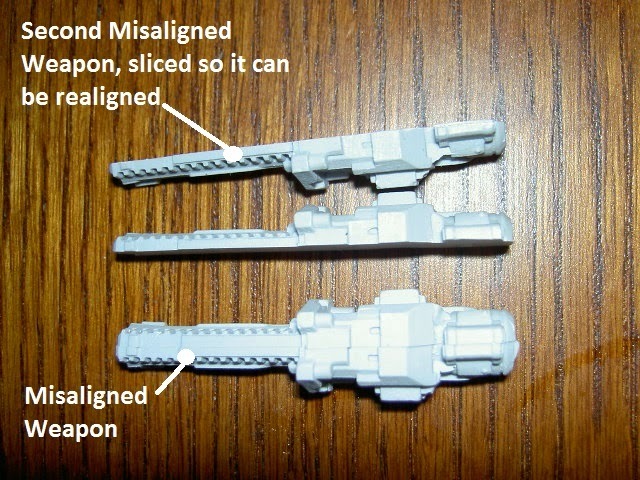 The guns were so misaligned that I had to cut them down their length to realign them. I think that the main issue I had with the legs could be as a result of them being cast as a single item, rather than being broken down into two legs and pants for casting. What about the metal components? Fortunately, they were much better and didn't need too much clean-up. Iwas disappointed to find that I have been given opposite fists rather than two left fists (like I ordered) but I am not hugely concerned as it will just mean that one of my eight mechs will be a lefty (a special character... maybe the overall leader). 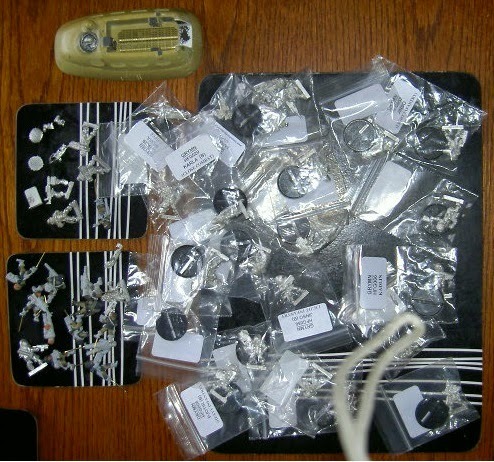 I still have to sort out the metal components for the light mechs but I have checked them and they are all correct so it will just take me the time to clean them up prior to assembly. So quality control could be better but I am not unduly concerned (however... it did take the shine off a little). I could complain but I can't really be bothered as I have made the best of them anyway and it just adds time and awkwardness to the whole thing... and I want these to be assembled... NOW! That's right. The Engineseer now has some transport for him and his two servitors. I will be adding a servitor head in the hatch on the front to act as the driver and I will also be adding a mechanical arm and a pair of bolters. 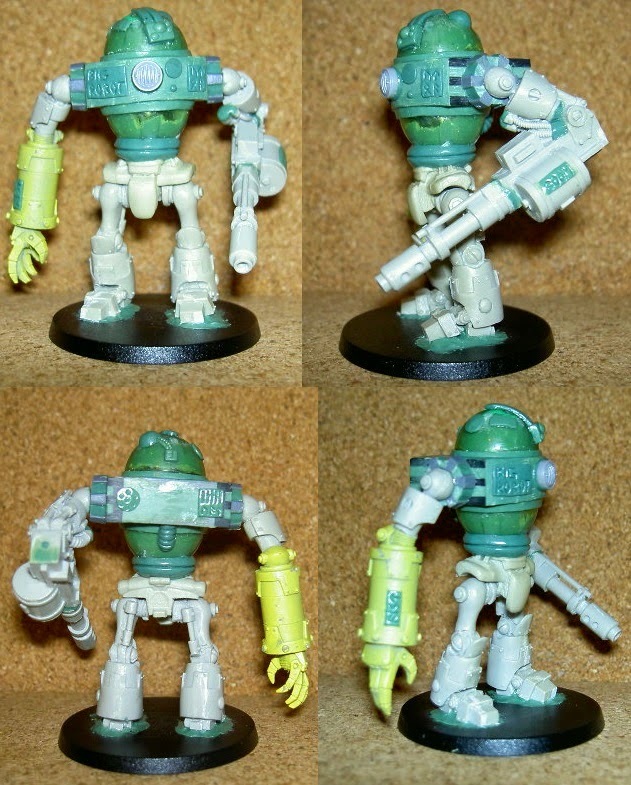 Big Robot will either have to walk or be sent off to another army. but with the head sculpted by another sculptor. This coming week should be one of more component cleaning, assembling, filling and maybe a bit of converting. ... and I have to go into the gas chamber again (yes... it is that time of year again). See you through the bleary eyes of realisation! 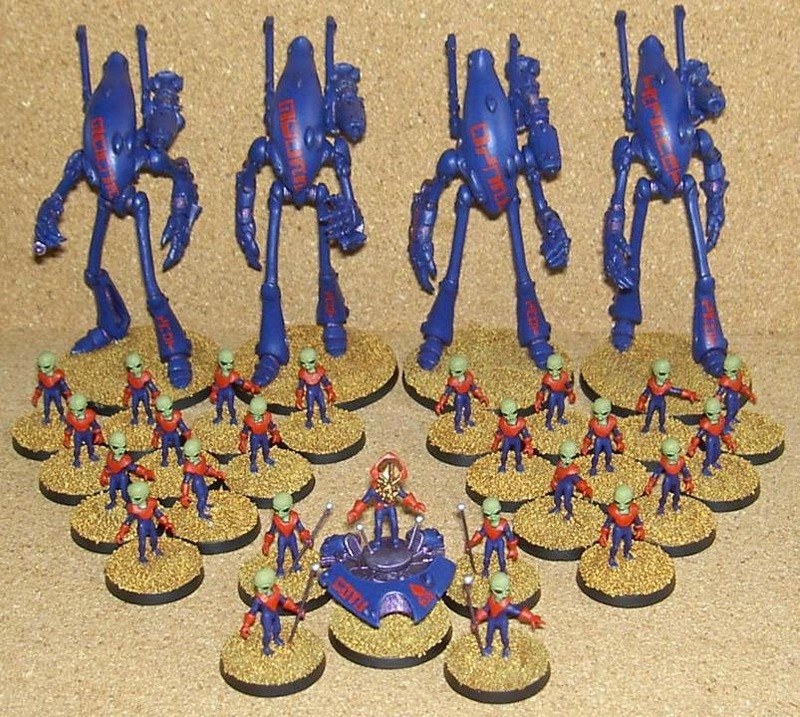 Adherence to ceremony and a host of new mecha. Today is Remembrance Sunday. It is a day when my family visit the local town of Wallingford to attend the ceremony of Remembrance. Every year (when I am in the country) we do the same and every year, the square is filled with people who are also there to pay their respects and give humble thanks for the ultimate sacrifice of so many people so that we could live in relative peace and freedom today. In 2007, I went to Iraq for a couple of weeks to carry out some maintenance on a helicopter there. When the plane landed, we discovered that three of our colleagues had just been killed when a rocket landed in their accomodation area. Today, I remembered them. 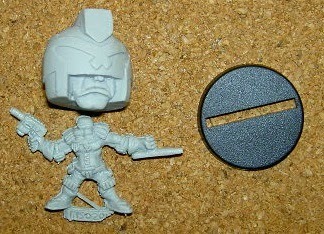 In the top pic, I have provided a ruler, standard 28mm human and a Grymn for scale. 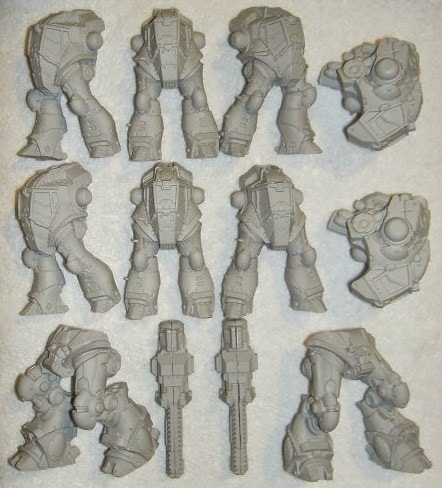 As you can see, the mechs are quite large (60mm and 90mm without the rocket pods). 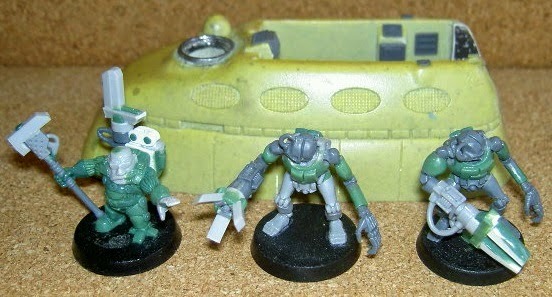 In the lower pic I have shown all of the arms, shoulderpads and rocket pods. Overall, the quality is excellent but, and there is a but, the two resin guns (bottom left) have a bit of a step in them (mould mismatch) that will need a little extra work to put right. 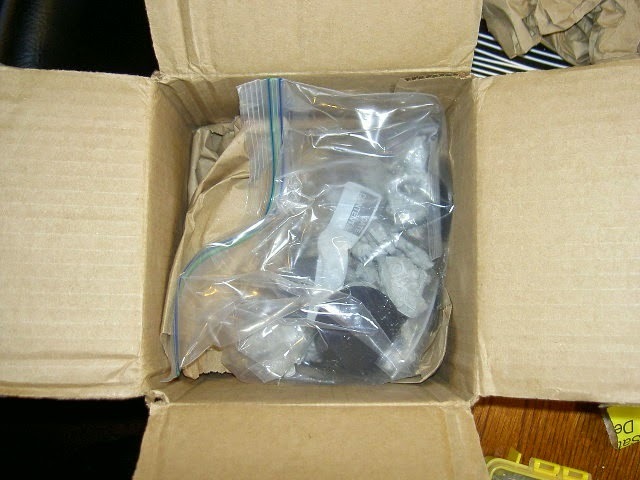 It isn't a total catastrophe... just a bit of extra work with a knife and file. The resin pieces have a few bits of waste resin to trim off and I think there is a single, small, airbubble on one of the medium mech bodies... but the details are sharp and everything looks brilliant. I am likely to leave them as they are for the time being as I don't want to rush them and I haven't decided which particular army/unit they are going to join so they will be 'awaiting paint' for a while; until I make a decision. 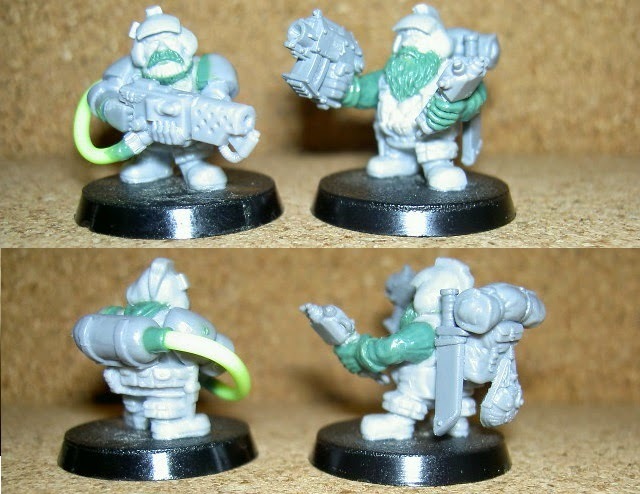 The command squad uses pistols from the Khorne Berserker boxed set and as a result, the hands are quite large. I can live with it but it may not be to everyone's taste. 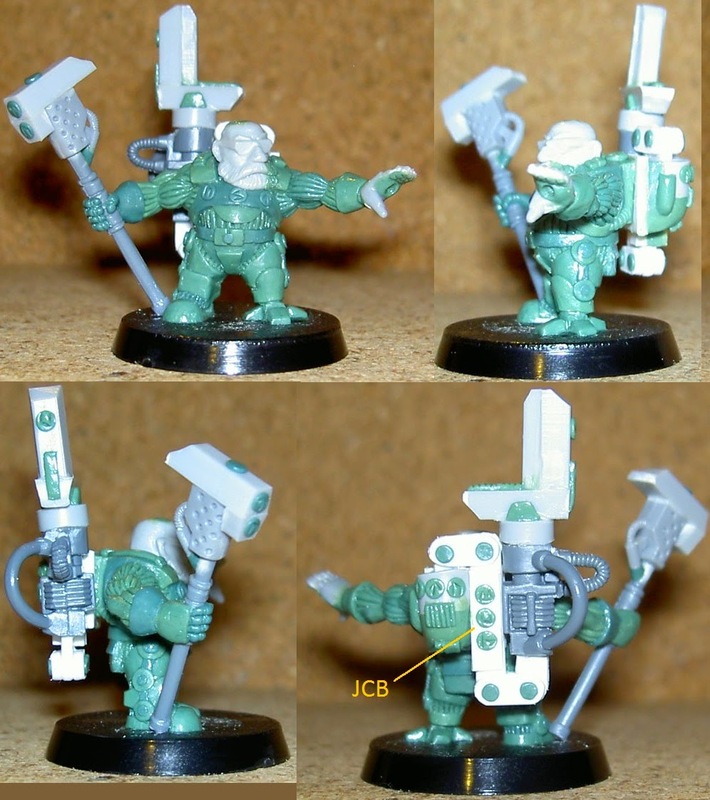 The flamer Squat uses shortened space marine arms for extra protection. The hose from the cannister to the flamer is a piece of brass wire with a 'Scouby' string covering it... sometimes having a daughter who is into crafts is handy when conversions are being created. This coming week, I am planning to work on the other three members of the command squad whilst ticking along with Big Robot... however, with so much mecha goodness sitting in a box nearby, I am not confident in my resolve to ignore them! See you from a place of respect! I know it's Saturday but this is just too good not to share. That is all I am showing off today because I am very hungover and daren't go any further with unpacking for fear of messing everything up. I hope that all of the bits are there but I will have to wait until later for a full inspection. See you from my cloud! Hello again. Another week has passed and it is time for another update. This week has been one of a virus for a couple of days, some very quick (for me) running, some sculpting and a trip to London. So... Monday and Tuesday, I got a bug that knocked me for six. I had no energy for anything but still dragged myself into work. Wednesday and Thursday, I felt much better so was able to go for a couple of runs. First a 3 miler (at 8min 20sec mile pace) and then a 4 miler (at 8min 28sec mile pace); both much quicker than the usual 9 minute mile pace I have been used to. It goes to show the importance of having a running partner. 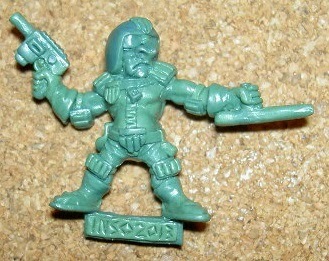 He's not perfect but he is now properly equipped for the task at hand. Since his completion, I have been working on the robot but have not got to a point where there is enough done to show very much progress so I will wait until next time for that. So... yesterday I went to London and managed to get a glimpse of the poppies at the Tower of London. Unfortunately, there was no chance to get in to see it properly due to the vast crowds of people there so it was a view through the railings for me. It didn't upset me that I couldn't see them clearly though... to be honest, I was humbled that so many people have taken the time and effort to go and see it... and bought poppies on the way. The rest of the trip to London was just plodding about in shops. 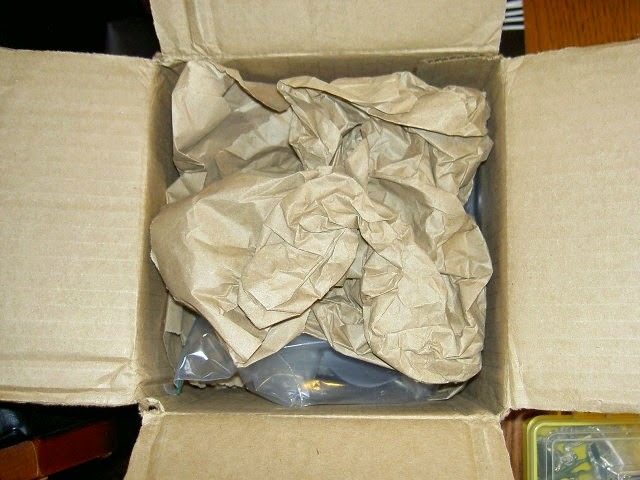 In other news, I have had notification that a parcel is waiting for me at a mail office. It is not my usual mail office and due to London, I can't pick it up until next Saturday... so I have a week to find out where it is. 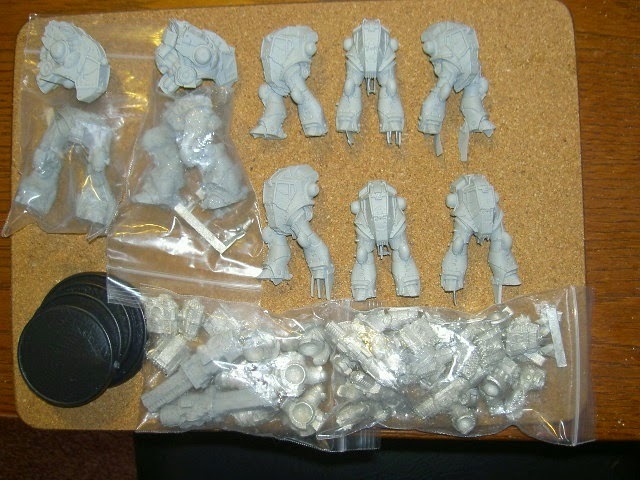 Part of the notification was that I owe £33.00 in charges and VAT so I can only assume that it is my mechs from Gangfight Games. This makes me very happy (even though I have to fork out additional money to pick them up). Well... that's about it for today. See you from through the railings!